The end user or subject is the person being authenticated. The OpenID Provider (OP) is the equivalent of a SAML Identity Provider (IDP). It holds end user credentials (like a username/ password) and personally identifiable information. During a single sign-on (SSO) login flow, end users are redirected to the OP for authentication. The Relying Party or RP or client is software, like a mobile application or website, which needs to authenticate the subject. The RP is an OAuth client. To learn more about the differences between OAuth, SAML and OpenID Connect, read this blog. 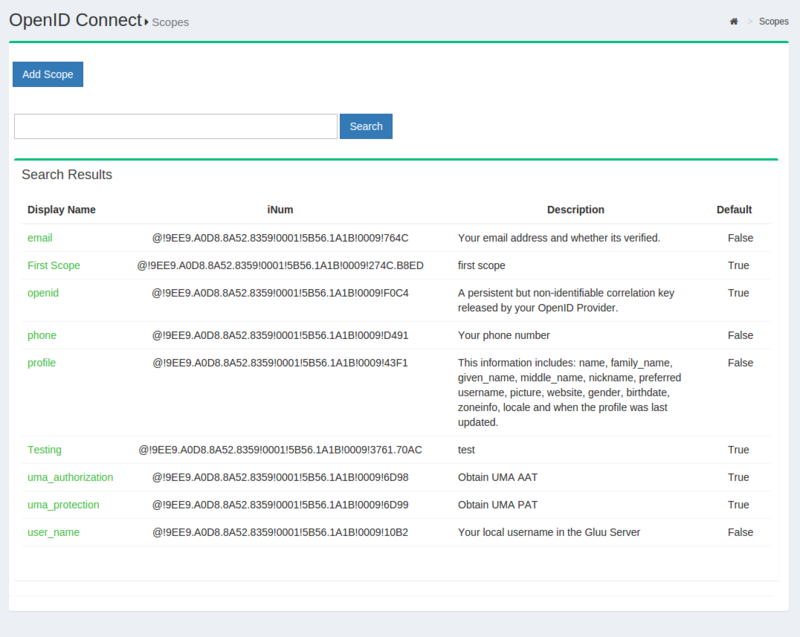 Review the Gluu Server's OpenID Connect API endpoints in the API Guide. 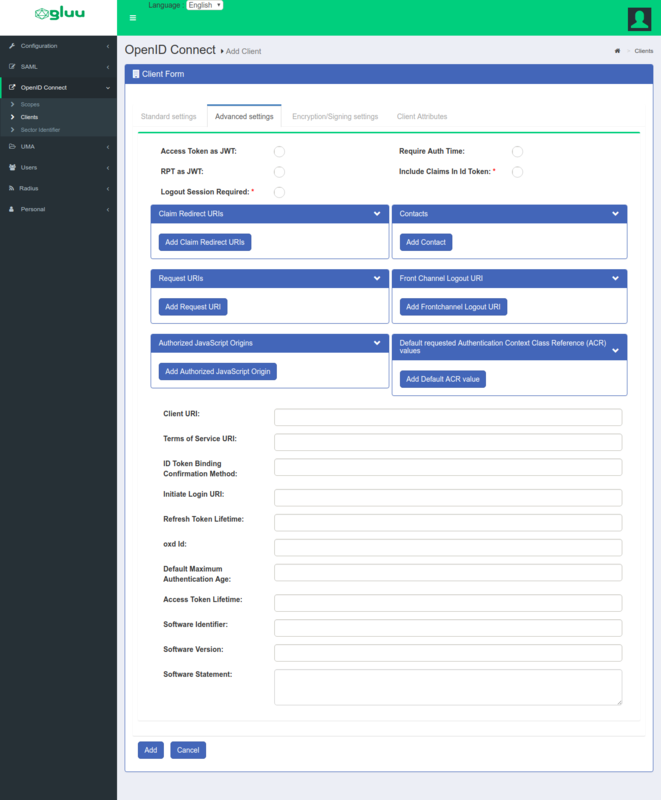 The Gluu Server supports all flows defined in the OpenID Connect Core spec, including implicit, authorization code, and hybrid flows. The code flow or hybrid flow should be used for server side applications, where code on the web server can more securely call the token endpoint to obtain a token. The most useful response type for the hybrid flow is code id_token. Using this flow, you can verify the integrity of the code by inspecting the c_hash claim in the id_token. If you are using the code flow, the response type should only be code. There is no point in using response type code token id_token--the extra tokens returned by the authorization endpoint will only create additional calls to the LDAP server and slow you down. If you are going to trade the code at the token endpoint for a new token and id_token, you don't need them from the authorization endpoint too. 1 User accesses an application. User accesses an application. User accesses an application. 2 The application/relaying party (RP) prepares an authentication request containing the desired request parameters and sends it to the OpenID Provider (Gluu Server). The response_type requested is code. The application/replaying party (RP) prepares an authentication request containing the desired request parameters and sends it to the OpenID Provider (Gluu Server). The response_type requested is id_token or id_token token. The application/replaying party (RP) prepares an authentication request containing the desired request parameters and sends it to the OpenID Provider (Gluu Server). The response_type requested is code id_token, code token, or code id_token token. 3 The OpenID Provider (Gluu Server) verifies the user’s identity and authenticates the user. The OpenID Provider (Gluu Server) verifies the user’s identity and authenticates the user. The OpenID Provider (Gluu Server) verifies the user’s identity and authenticates the user. 4 The OpenID Provider (Gluu Server) sends the user back to the application with an authorization code. The OpenID Provider (Gluu Server) sends the user back to the application with an ID Token (id_token or id_token token) and an Access Token (token). The OpenID Provider (Gluu Server) sends the user back to the application with an authorizatio code (code id_token, code token, or code id_token token) and an Access Token (token). 5 The application sends the code to the Token Endpoint to receive an Access Token and ID Token in the response. The application uses the ID Token to authorize the user. At this point the application/RP can access the UserInfo endpoint for claims. The application sends the code to the Token Endpoint to receive an Access Token and ID Token in the response. 6 The application uses the ID Token to authorize the user. At this point the application/RP can access the UserInfo endpoint for claims. The application uses the ID Token to authorize the user. At this point the application/RP can access the UserInfo endpoint for claims. The Gluu Server also supports WebFinger, as specified in the OpenID Connect discovery specification. OAuth clients need a client_id and redirect_uris to indicate to the Authorization Server where users should be redirected post authorization. Clients can be created manually in oxTrust or dynamically registered via the standard API. There are many client configuration parameters. Most are specified in the Client Registration section of the OpenID Connect specification. The Client Secret field features a Lock Secret Field button to prevent accidental edits or autofill. Pre-Authorization: If the OAuth authorization prompt should not be displayed to end users, set this field to True. This is useful for SSO to internal clients (not third party) where there is no need to prompt the person to approve the release of information. 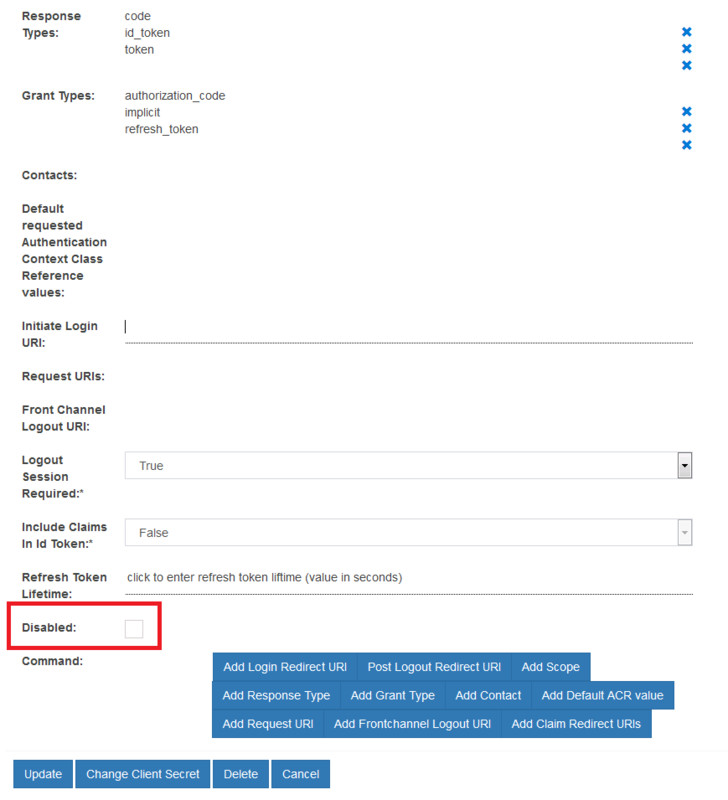 Persist Client Authorizations: If end users should only be prompted for authorization the first time they access the client, set this field to True. All data will be persisted under the person's entry in the Gluu LDAP and the end user will not be prompted to release informationd during subsequent logins. This feature is automatically set to True if Pre-Authorization is enabled. 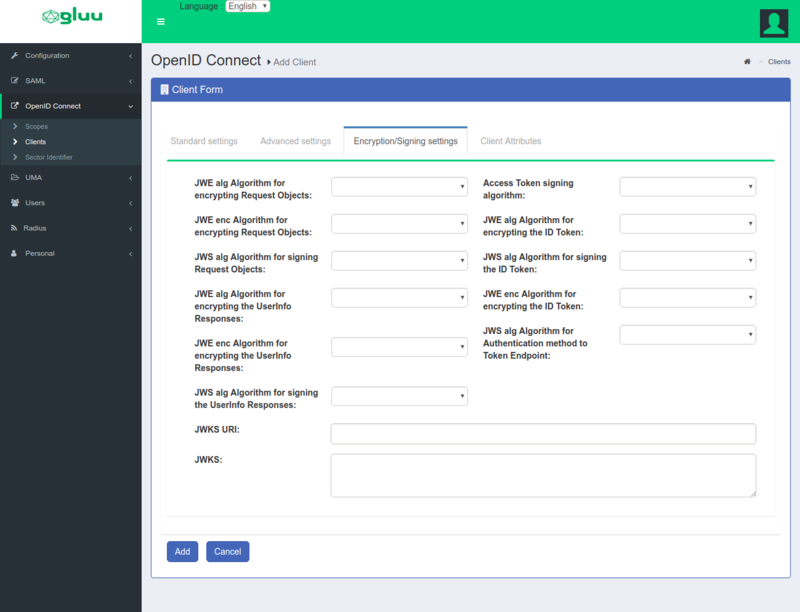 OpenID Connect defines a standard API for Dynamic Client Registration. The registration URL can be found at the configuration endpoint: https://<hostname>/.well-known/openid-configuration. 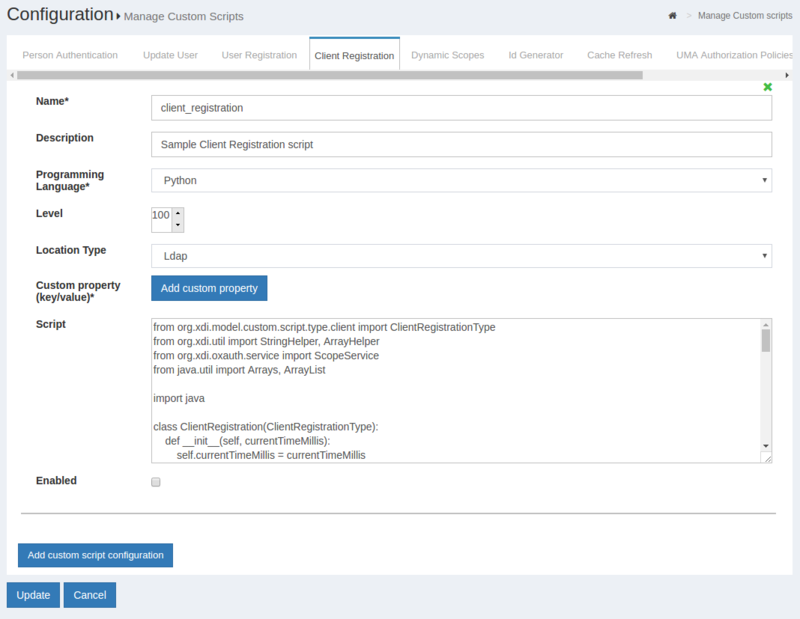 To manage this feature in oxTrust, navigate to Configuration > JSON Configuration > oxAuth configuration, and find the dynamicRegistrationEnabled property. Set it to true or false to enable or disable dynamic client registration, as needed. Expiration of dynamically registered clients is controlled by the dynamicRegistrationExpirationTime property, which can also be found in the oxAuth configuration table. Find more details about these oxAuth properties and others in the reference section. During client registration, custom interception scripts can be used to implement custom business logic. For instance, data could be validated, extra client claims could be populated, scopes could be modified, or APIs could be called to determine whether the client should get registered at all. Client registration custom script interfaces can be found by navigating to Configuration > Custom Scripts > Client Registration. If the redirect URI to be added to a client is in the same domain as the server, the URI can be added via the Add Redirect URI field in the Client Registration form. If the URI is in a different domain, it must be added via a sector identifier. In OAuth, scopes are used to specify the extent of access. For an OpenID Connect sign-in flow, scopes correspond to the release of user claims. Out-of-the-box, Gluu supports the standard scopes defined in the OpenID Connect specification. Custom scopes can be defined and mapped to any registered user attributes. Display Name: Name of the scope which will be displayed when searched. Description: Text that will be displayed to the end user during approval of the scope. OpenID: specifies to the Gluu Server that this scope will be used to map user claims. Dynamic: specifies to the Gluu Server that scope values will be generated from the result of the Dynamic Scopes custom interception script. OAuth: specifies to the Gluu Server that the scope will have no claims, it will be meaningful to an external resource server. Allow for dynamic registration: Select whether a client using the scope is allowed to dynamically register the scope, as well. 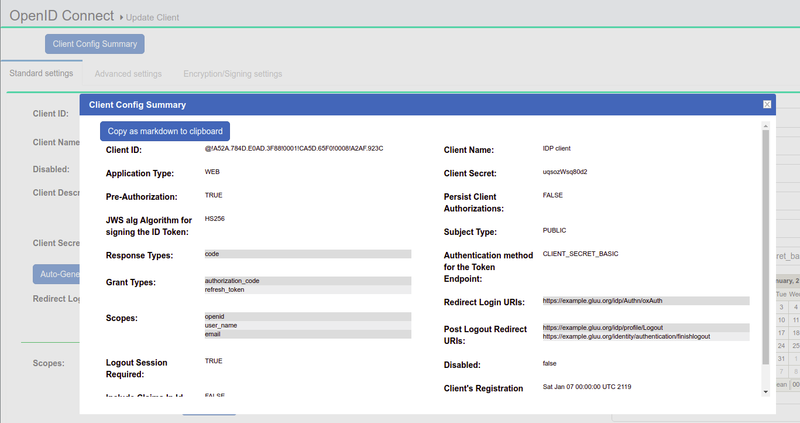 Similar to client registration, scopes can be customized using interception scripts. The interface can be found in oxTrust by navigating to Configuration > Manage Custom Scripts > Dynamic Scopes. The sample dynamic scope script is available here. A Subject Identifier is a locally unique and never reassigned identifier within the Issuer for the End-User, which is intended to be consumed by the Client. The can be found by navigating to Configuration > oxAuth Configuration. Two Subject Identifier types are defined in oxAuth: public and pairwise. This provides the same sub (subject) value to all Clients. It is the default if the provider has no subject_types_supported element in its discovery document. You can configure the LDAP attribute to be used in the sub claim. When pairwise Identifiers are used, Gluu calculates a unique sub (subject) value for each Sector Identifier. The Subject Identifier value must not be reversible by any party other than the OP. This is similar to persistent identifiers in SAML. Sector identifiers provide a way to group clients from the same adminstrative domain using pairwise subject identifiers. In this case, each client needs to be given the same pairwise ID for the person to maintain continuity across all the related websites. A user's associated Pairwise IDs can be viewed and managed directly in LDAP, or more conveniently in their oxTrust user record. Check the Manage People doc for more information. oxAuth provides an easy way to manage and publish a sector_identifier_uri. The Gluu admin can use this feature to select certain clients or even add ad-hoc redirect_uri values. oxAuth will publish a valid sector identifier JSON object as defined in OpenID Connect dynamic client registration spec. A client could then register this sector identifier URI in addition to redirect URIs. 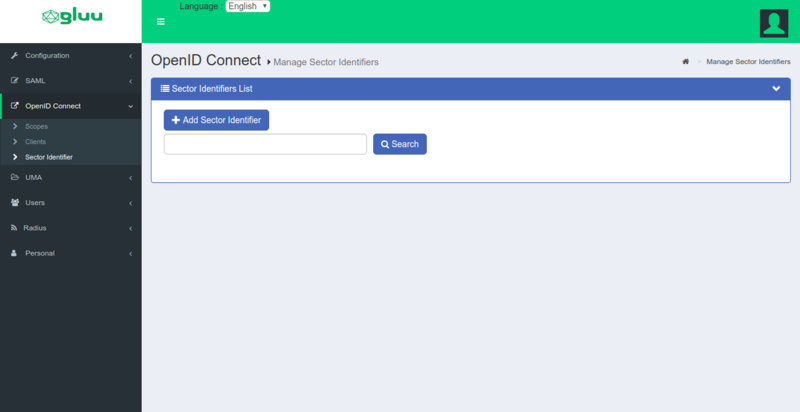 In oxTrust, navigate to OpenID Connect > Sector Identifier. Add redirect URIs to the Sector Identifier. Add clients that uses the Sector Identifier. The OpenID Connect acr_values parameter is used to specify a workflow for authentication. The value of this parameter, or the default_acr_values client metadata value, corresponds to the "Name" of a custom authentication script in the Gluu Server. Clients can request any enabled authentication mechanism. To enable an authentication script in oxTrust, navigate to Configuration > Manage Custom Scripts, find the desired script, check the Enabled box, scroll to the bottom of the page and click Update. Learn more in the authentication guide. The Gluu Server also support the draft for Front Channel Logout. This is our recommended logout strategy. Using front channel logout, an html page is rendered which contains one iFrame for each application that needs to be notified of a logout event. The Gluu Server keeps track of which clients are associated with a session (i.e. your browser). Front channel logout is also not perfect. If the end user's web browser is blocking third party cookies, it may break front channel logout. Also, the Gluu Server has no record if the logout is successful--only the browser knows. This means that if the logout fails, it will not be logged or retried. The good thing about front channel logout is that the application can clear application cookies in the end user's browser. To use front channel logout, the client should register logout_uri's, or frontchannel_logout_uri for clients using the Dynamic Client Registration API. 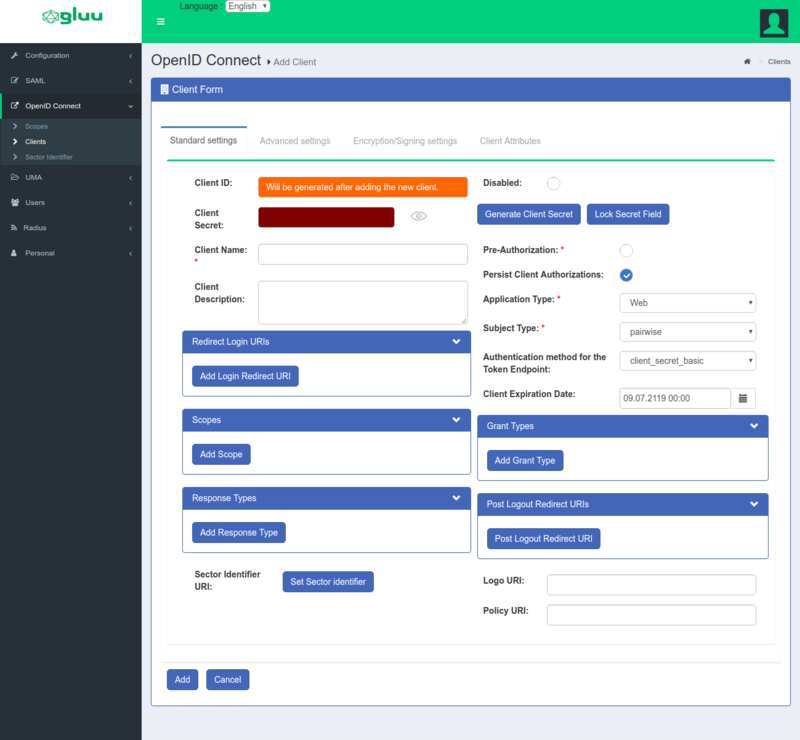 In order to leverage your Gluu Server OpenID Provider (OP) for central authentication, web and mobile apps will need to support OpenID Connect. In OpenID Connect jargon, your app will act as an OpenID Connect Relying Party (RP) or "client". There are many ways to go about supporting OpenID Connect in your apps. When possible, it is best to use existing client software implementations that have been verified to implement OpenID Connect properly (and securely!). A good OpenID Connect client will do much of the heavy lifting for you. Review the SSO integration guide to determine which software and strategy will be best for your target application(s). The Gluu Server ships with an optional OpenID Connect RP web application called oxauth-rp which is handy for testing. During Gluu Server setup you'll be asked if you want to install the oxauth-rp (it should be installed on a development environment). If you decide to install it, oxAuth RP will be deployed on https://<hostname>/oxauth-rp. Using the oxAuth RP you can exercise all of the OpenID Connect API's, including discovery, client registration, authorization, token, userinfo, and end_session. access_token_as_jwt - Boolean controlling whether to return the access_token as a JWT. It is false by default. access_token_signing_alg - signing algorithm that has to be used during JWT signing. If it's not specified, then the default OP signing algorithm will be used (specified via defaultSignatureAlgorithm oxAuth configuration property). client_id - Client identifier for the OAuth 2.0 client that requested this token. token_type - Type of the token as defined in Section 5.1 of OAuth 2.0 [RFC6749]. exp - Integer timestamp, measured in the number of seconds since January 1 1970 UTC, indicating when this token will expire, as defined in JWT [RFC7519]. iat - Integer timestamp, measured in the number of seconds since January 1 1970 UTC, indicating when this token was originally issued, as defined in JWT [RFC7519]. sub - Subject of the token, as defined in JWT [RFC7519]. Usually a machine-readable identifier of the resource owner who authorized this token. aud - Service-specific string identifier or list of string identifiers representing the intended audience for this token, as defined in JWT [RFC7519]. iss - String representing the issuer of this token, as defined in JWT [RFC7519]. Gluu now supports Token Binding, per the specification. At this time, Token Binding is only supported in Ubuntu 18. This specification enables OpenID Connect implementations to apply Token Binding to the OpenID Connect ID Token. This cryptographically binds the ID Token to the TLS connections between the User Agent and Relying Party (RP) over which the authentication occurred. This use of Token Binding protects the authentication flow from man-in-the-middle (MITM) and token export and replay attacks. A new client property called id_token_token_binding_cnf is now available via Dynamic Registration or in the oxTrust OpenID Connect client form (ID Token Binding Confirmation Method), which is a string value specifying the JWT confirmation method member name (e.g. tbh, as shorthand from token binding hash) that the Relying Party expects when receiving ID Tokens with Token Binding. The presence of this parameter indicates that the client supports Token Binding (ID Token contains JWT confirmation method). If omitted, the client will not support Token Binding. User Agent (browser) has to support Token Binding. It is known that Chrome browser supports Token Binding as experimental feature which can be turned on/off if you navigate to chrome://flags/#enable-token-binding. The mod_auth_openidc Apache module supports Token Binding.